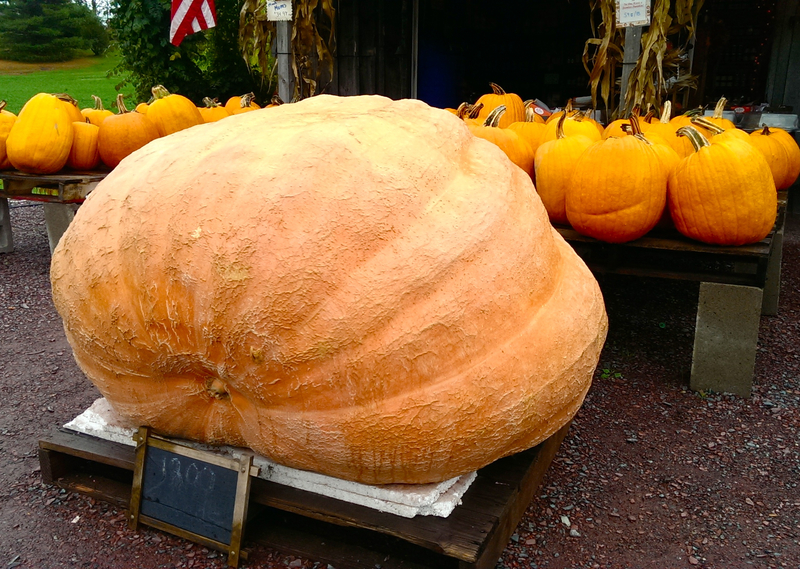 Vermont and… Omega-dness – a wee detour to New York! 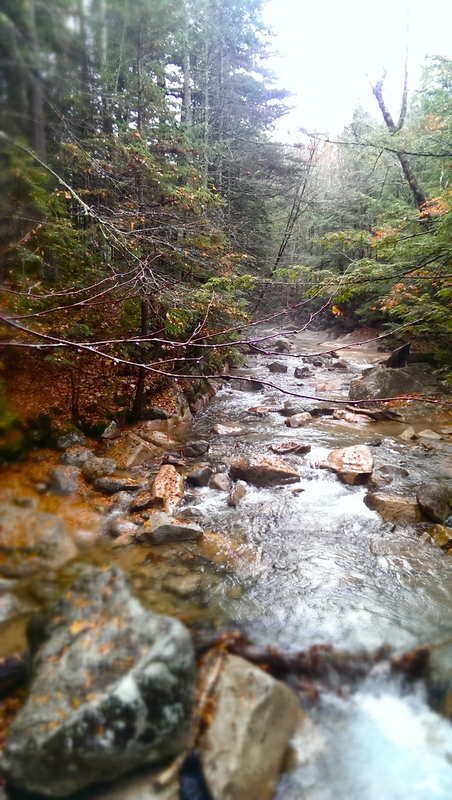 On Kate’s urging, I headed north to Vermont through scenic Franconia Notch. This mountain pass, an entrancepoint to the 3,500km Appalachian Trail, has historically drawn visitors to its natural rugged beauty. 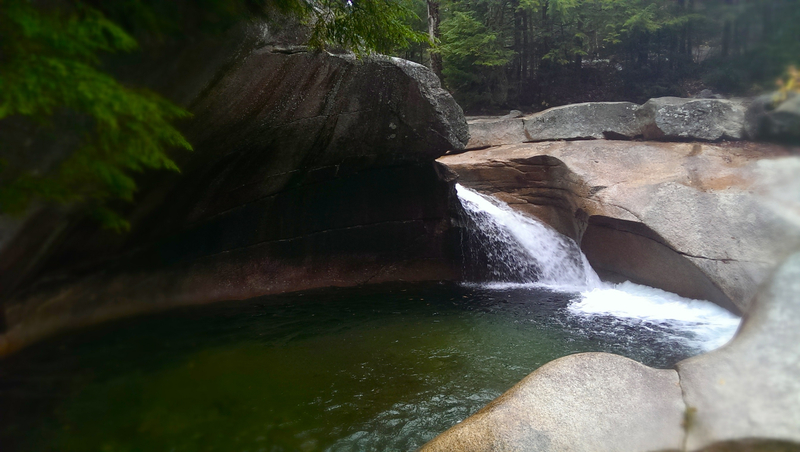 Thoreau wrote about the storied landmarks around Franconia Notch, probably contributing to their oversized fame. But that day the clouds were sunk low; pelting rain and harsh winds whipped through the valley. I briefly visited the Flume and the Basin, unique canyons carved by the path of water over millennia. I pulled over to see if I could glimpse the famous Old Man of the Mountain, a distinct profile of an old man’s face jutting out of the rock high on the peak. But I learned that even on a clear day, I wouldn’t be able to see the Man – years ago, his face broke suddenly due to erosion, the official symbol of New Hampshire crumbling down the hill. All that’s left is the lonely decaying infrastructure of a cheesy tourist stop. Driving across Vermont was a pure delight, twisting through the rolling hills dotted with dairy farms and rusted silos from a bygone era. Roadside sugarhouses lured me in to buy maple cream and taste test various syrups from the nearby maples. In these sleepy New England towns, the original brick buildings and stately white clapboard homes with black shutters have remained for a century or sometimes two. Pumpkins and dried cornstalks decorated the entranceways. I was still struggling my way through Walden, and I have to admit that I absorbed only a small fraction of his careful words. Our patterns of speech and word choices have changed so much. Thoreau would be horrified to know that I was attempting to listen to Walden rather than read it. One section of the book that stood out was a longwinded explanation of his disdain for the spoken form. Reading seems to be one of the few things he approved of. He spent most of his free time engaged in reading the ancient Greek and Roman classics, or writing about the importance of reading them. I arrived at my Burlington couchsurf destination to find a cooperative household of nine people around their twenties, with chickens in the garden and a stocked bike repair shop in the backyard. 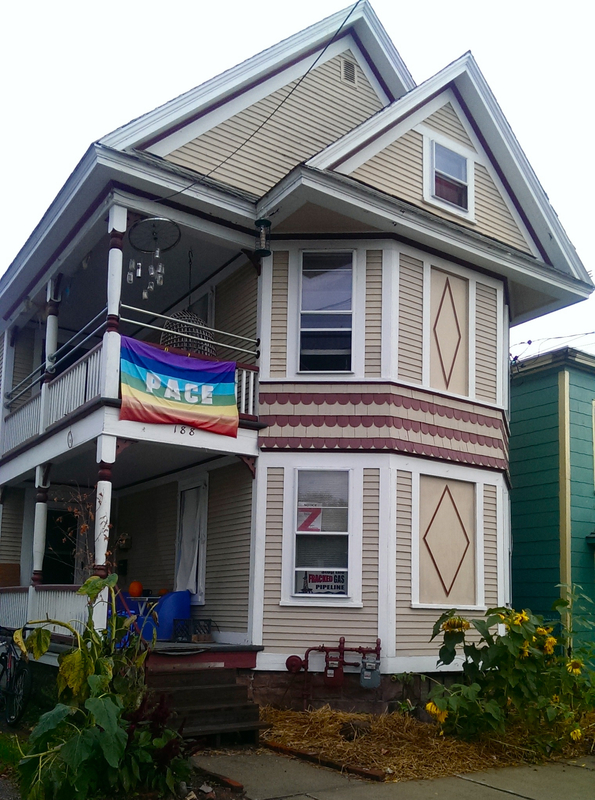 This intentional community is decidedly urban. Will, Alex, Elora, Amalia, Nick, Jakob, Hannah, Chris, and Noelle share the space with a constant flow of couchsurfers curling up in the cozy attic nook. They have weekly meetings and a complex system of rotating chores, including things like baking bread for the household, and buying shared groceries at the co-op. Homebrew beers, fermented krauts, and homemade herbal preparations stock the shelves. I pinpointed their home by searching the word “permaculture” on the Couchsurfing site. 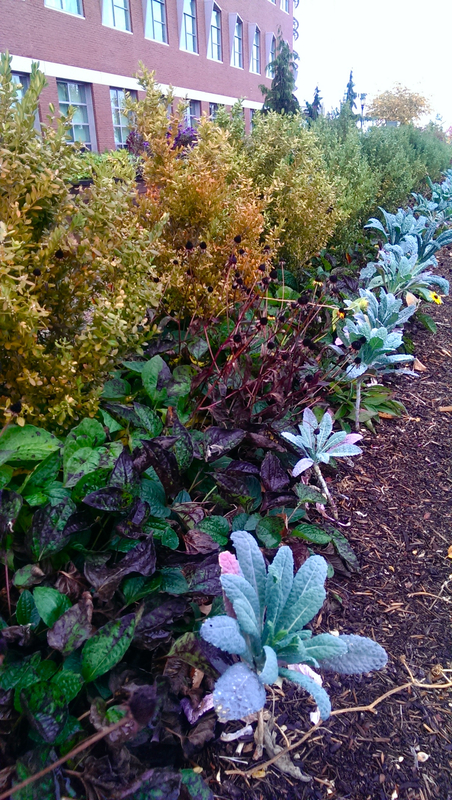 It turned out that most housemates had taken their permaculture design course through the University of Vermont – exactly the kind of students I’d been hoping to connect with! It was interesting to see what kinds of goals and choices they were making in their lives. Several were involved in local food initiatives like establishing public orchards, doing garden education with kids, or work trading with local farms for a truckload of cider apples or a quart of kimchi. Megan and I, reunited at last! Burlington is renowned for being dripping with cyclists, locavores, outdoor adventurists, and a bustling arts and culture scene. It didn’t disappoint. Immediately after my arrival, I was dancing up a storm with my housemates to the funky R&B of local sensation Kat Wright and the Indomitable Blues Band. I was excited to visit my friend Megan, who lived in Victoria for many years and had just recently returned to New England. 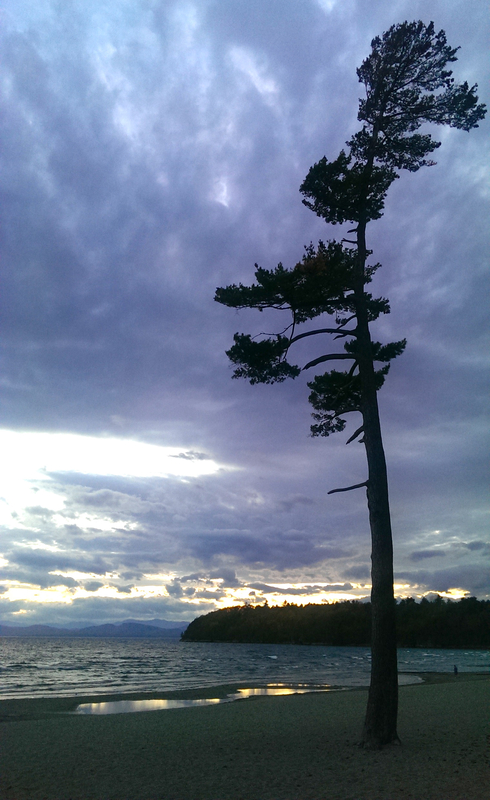 We swallowed some strong local brews on the shores of Lake Champlain, watching the sun set into the streaky clouds before gobbling Vietnamese pho and wandering pedestrian-only Church Street, where it seemed every second building was a bustling pub. 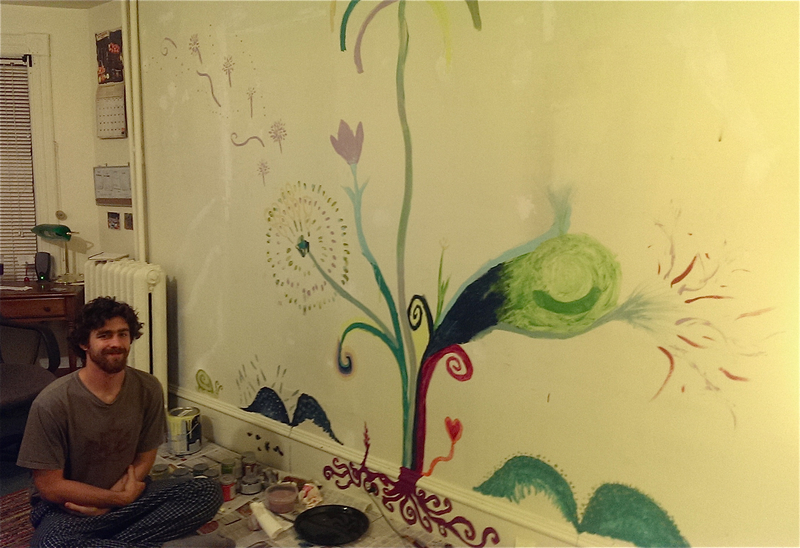 The last night, I stayed in to get to know Will’s story while we painted a community mural on his wall. Will linked me with several folks to visit and stay with, and I’m grateful for the connection. Right. About the permaculture stuff. 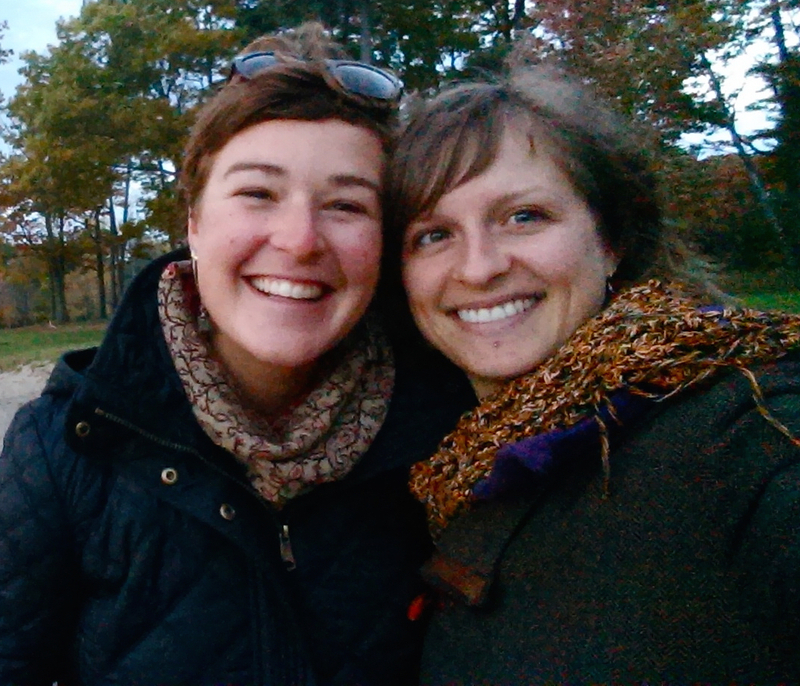 I had the fortune of joining a University of Vermont PDC class as they practiced site analysis at Rock Point School. After walking the grounds – a mix of maple forest, conference and education buildings, community gardens, and rocky coastline – a design charette ensued. Groups created base maps of the land outlining the permaculture zones, sectors, flows, microclimates, infrastructure, and the vibe or sense of place in various points on the landscape. I shot footage for my video and watched their presentations with excited nostalgia, remembering my own PDC. I could tell they were already starting to read landscapes differently. One highlight was visiting Keith Morris, a permaculture designer who is well-known in the region (ie. everyone I met in Burlington seemed to know him). 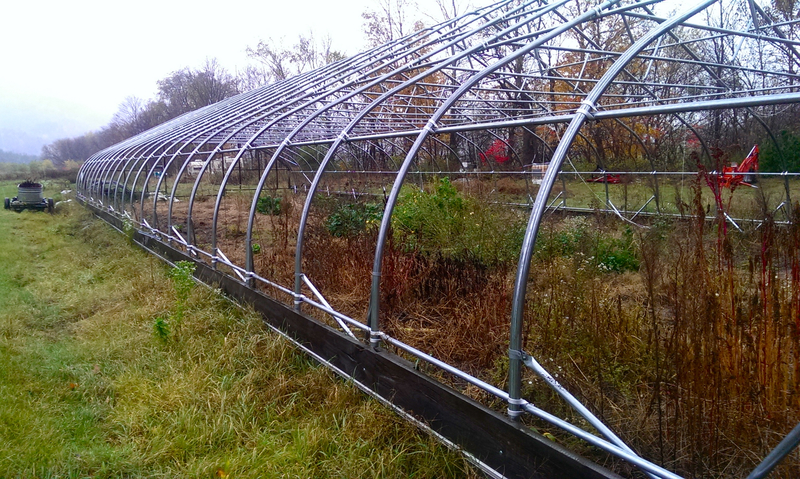 The founder of Prospect Rock Permaculture, Keith toured me around Willow Crossing Farm. He’s been doing a lot of tree research with hazelnuts, chestnuts, pine nuts, walnuts, pecans – and some new-to-me hybrids: butternuts, “buartnuts,” “butter-buarts,” and “hicans.” Oh the joys of genetic diversity! His farm also seeks, as he says, to make an example of profitable reforestation of river corridors while creating wetland habitat and stabilizing riverbanks with native and multipurpose trees. At least 10 feet of earth disappeared from the crumbling riverbank bordering his land during a serious flood last year. It’s just steps away from the yurt classroom, the composting toilets, and the solar outdoor showers used by his PDC students. Keith has a lot at stake in this experimentation, using vegetation to hold down the riverbank over time with their roots. But there’s also a focus on the other uses of the trees like coppicing for firewood, or structural poles for building materials. It’s a great example of how permaculture design can help to solve real-world land management challenges while producing a yield of food, fibre and energy. 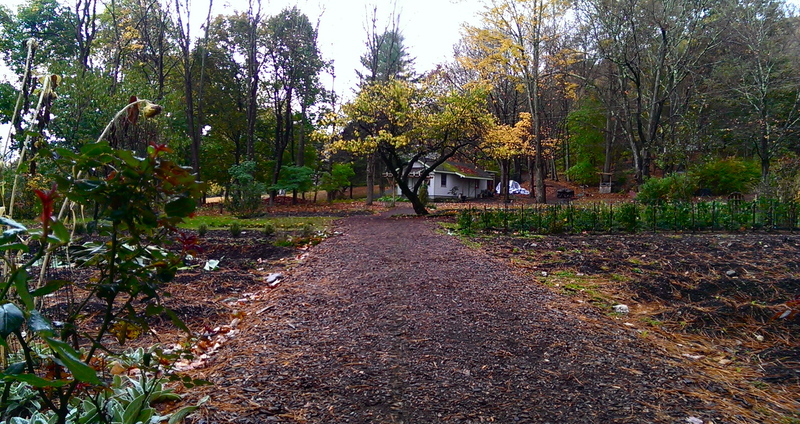 Keith imparted to me another gift: an invitation to the Northeast Permaculture Retreat at the Omega Institute! I’d already had great success with my interviews, capturing good film footage, and having a ball with my new couchsurfing buds. But this last-minute trip to New York state really blew my expectations for this trip out of the water. I got to spend three days living in a rustic cabin, eating three tantalizing mostly-vegetarian, mostly-local and mostly-organic buffet meals a day, steaming in the sauna, and learning Tai Chi at dawn. And instead of trying to cram in visits to folks all over the region, they all came to one spot, allowing me to connect with over thirty permies from Pennsylvania to Maine! There were CSA farmers, mushroom cultivators, environmental educators, horticulturalists, community organizers, leaders of successful permaculture design businesses, and some folks who actually teach permaculture in the academic world. I was in heaven. 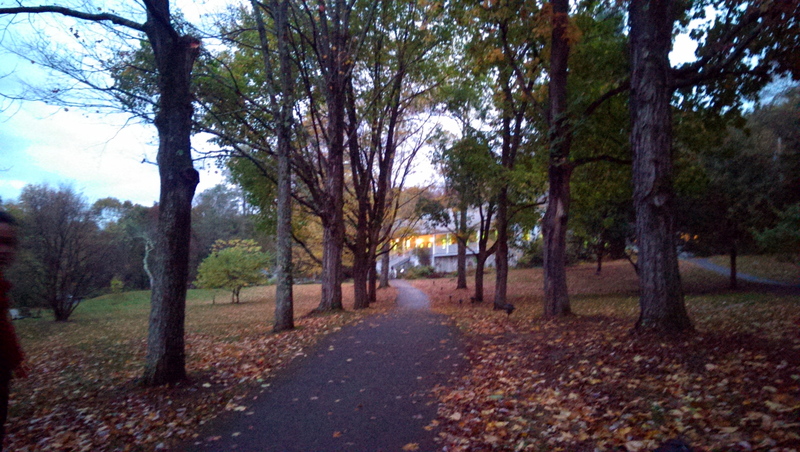 The highly regarded Omega Institute is an intentional community that hosts workshops on the beautiful site of an old Jewish summer camp near Rhinebeck NY, and is a frequent destination for retreats from New York City. Unlike the very white, homogenous towns and intentional communities I visited elsewhere in New England, the attendees were ethnically and culturally diverse. 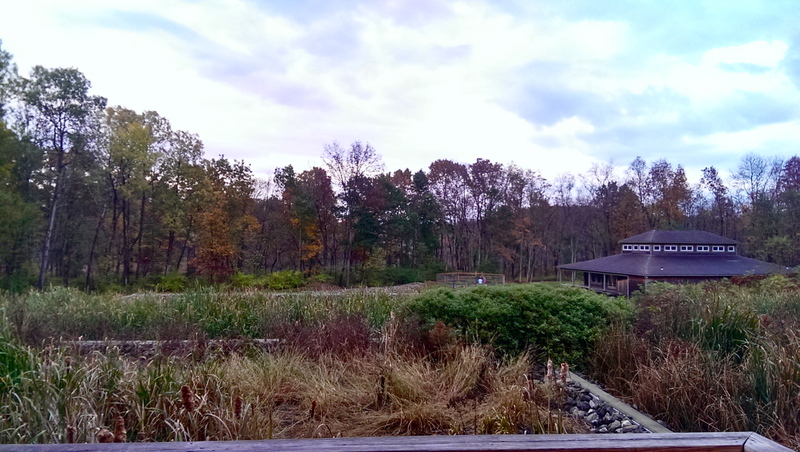 The gathering was held in Omega’s Center for Sustainable Living. This building meets LEED Platinum designation and the Living Building Challenge requirements, which are much tougher than LEED – a building must demonstrate that it can actually help to restore the environment. Shifting from being “less bad” and the concept of sustainability to being regenerative is a key idea in permaculture. Included in twenty imperatives relating to a healthy environment and habitat protection are requirements that virtually all waste from construction and operations must be eliminated, that the building must generate all of its own energy with renewable sources, and that it must capture and treat all of its own water. This follows the permaculture philosophy that there’s no such thing as waste – only stuff in the wrong place. The Lagoon – part meeting space, part sewage treatment facility! The building’s water cycling system is the most fascinating part. It was designed around Omega’s desire for an educational – and aesthetically pleasing – example of ecological water recycling onsite. Grey and black water are piped down to holding tanks where a complex web of microbial agents voraciously devour the nutrients. The water enters the “Lagoon,” a beautiful indoor paradise, where it feeds the roots of tropical plants along with another set of microorganisms and insects. By this time, the water doesn’t have the faintest odour. It is then released into a rocky constructed wetland, where the water will continue to be purified as it sinks into the ground, recharging the aquifer and ultimately being re-pumped by the well to rejoin the cycle of use. Can you imagine if all infrastructure operated like this? Our gathering was designed to reflect how the most valuable moments at retreats often don’t occur in the sessions at all, but over evening tea, or on walks together in the woods. I was inspired by the collaborative approach to facilitation, consensus-building, active listening, and negotiation that characterized its organization. Actually, very little had been organized: we held two days of open space sessions, in which the agenda and topics for the day were generated each morning by anyone who wanted to convene a session, and attended by anyone who felt like showing up. We talked about the nuts and bolts of the design biz, the future of the Permaculture Design Certificate, decolonizing permaculture, and including diverse and marginalized communities. I soaked it up, hoping to bring back my learnings and renewed energy to fuel creative projects back home. Feeling supported to rub up against my comfort zone, I decided to convene a session on permaculture in higher education. There were a lot of people interested in this subject! We shared an engaging discussion on the challenges and opportunities of bringing permaculture into the academic realm, and what it might mean for the teachers and students involved. My sense was that people in the group generally supported the idea of integrating academia and permaculture. I made key connections during this retreat with folks like Abrah Dresdale at Greenfield Community College, and Steve Gabriel at Cornell University, who is working to connect people involved in permaculture research and education at universities. Being there really reinforced my sense that this kind of network building is a need and perhaps a niche looking to be filled further. I’ve been thinking a lot about how my research can be utilized for its highest use in the permaculture world. As you can imagine, I’ve been feeling pretty grateful lately. I’ve had many folks thank me for doing this research and for articulating to me that it is important and needed. It’s not to toot my own horn (the usefulness of the results is yet to be determined!) but rather a noticing that not every Master’s student gets to hear things like this regularly, and to combine their passion so closely with their research. And have some pretty sweet travel adventures to boot!